You know what, I'm declaring this month the month of sucky anime endings. 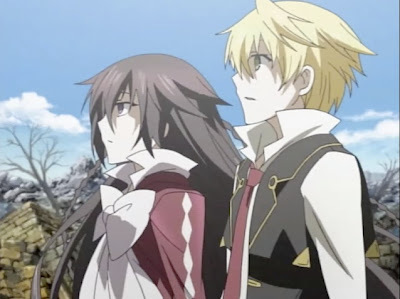 Following 07-Ghost and Phantom, Pandora Hearts continues on to become the next victim of bad endings. To be honest, I kind of saw it coming about two thirds of way through, because the setting of the story is way too massive and complicated to finish within the 25 episode limit. However, despite that incomplete ending, I think this is a very well made series and I enjoyed watching it quite a bit. It has some slow moments, but like I said in the earlier posts, it's mostly due to the level of complexity of the story, not bad directing or screen writing. Recommendation: Incomplete anime like this may annoying many people. But overall, this is a quite brilliant story. I never thought it would have such a big plot scope. My first impressions were rather mixed, i liked the story and surroundings and characters and disliked the lack of anwsers, thrill and decent development in conversations. I have seen many animes but this is something else, it's story is so big and dragged around that it is hard to see the real story core. Umineko no Naku Koro ni: Huh?